MUFG Bank has been named the Best Trade Finance Provider 2017 in Japan by Global Finance magazine. 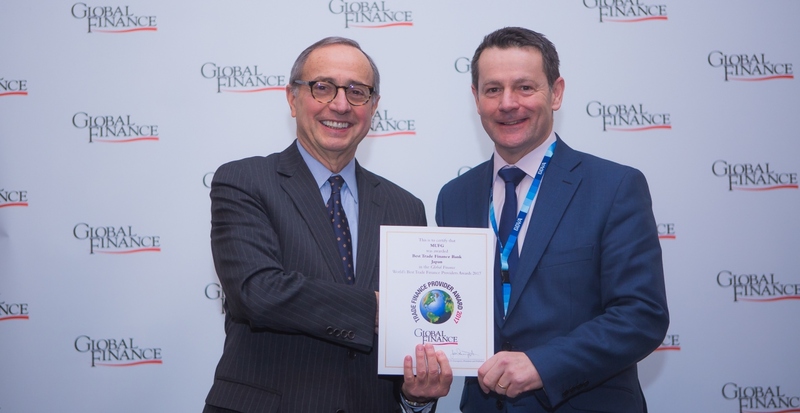 The editorial review board of Global Finance selected the best trade finance providers based on input from industry analysts, corporate executives and technology experts. In addition, a poll of Global Finance's readership was conducted in order to increase the accuracy and reliability of the results. Criteria for choosing the winners included: transaction volume, scope of global coverage, customer service, competitive pricing and innovative technologies. "We are delighted to have been named as the best trade finance provider of 2017 in Japan. MUFG's trade finance team prides itself on providing our customers with an expanding range of innovative working capital and trade finance services. We look forward to continuing to strengthen our offering throughout the year, especially in light of the current turbulence in the global market." “As global markets digest slowly improving economic conditions in the US, counterbalanced by the economic slowdown in China and the evolving role of the Chinese consumer, trade dynamics are changing,"